Operating Era: 1912-1965. Pennsylvania RR, Vandalia RR, Cumberland Valley. The first 40' box car on the railroad, Pennsy built over 6,900 in 1912-13 for Line East and West, Vandalia Line and Cumberland Valley. Some Penna. Co. cars were lettered for Union Line fast freight. All cars became PRR in 1920 with system unification but cars were not relettered until 1922. Longitudinal stringers were added to the floor in the early-to-mid-1920's. Door rollers and 2D-F8 trucks were added beginning in 1928. Doors requiring replacement recived Youngstowns. Leaking roofs received lap seam roofs similar to X29's. Lettering was revised to the new ARA standards. In 1931 the Keystone herald was added. In 1939 cars requiring resheathing received horizonal sheathing which allowed the horizontal braces and side sill beams to be removed. Shortly after this began, over 700 received round roofs during resheathing, creating the X23B class. A few cars had their roofs removed for coke service, class X23A. All cars ran through World War 2 before scrapping began. The last peaked roof car was scrapped in October 1955. Many cars were transferred to maintenance of way service in the same way as the XL box cars before them and ran well into the 1960's. NX23 war emergency cabooses were built in 1943 and these too were swiched to camp cars. 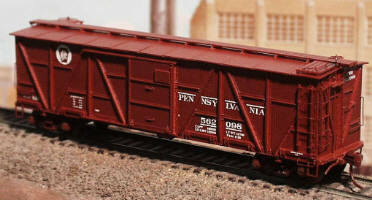 PLEASE SEE OUR SS BOX CAR SECTION FOR OTHER #10000 SERIES KITS. Decal Set Available.